With a growing list of options for health monitoring, Philips is hoping to rise to the top of the pile with its Philips Health Watch wearable. To stand out, it's pairing the watch up with a full array of devices called the Philips Health Suite that promise to work in tandem to help you maintain a healthy lifestyle. The company is also touting the fact that the Health Watch is FDA listed to make sure you know it's serious about tracking your health. We've spoken to Philips about the device to clarify what the listing means, and the director of personal health solutions told us: "All of the devices are FDA listed and clinically validated in terms of the accuracy of the data they collected and provide the user." That doesn't mean it's medical grade, and that's important to remember here. At $250, the wearable sits on the lower end of the smartwatch spectrum. But you have to remember, the Health Watch isn't really a smartwatch. It's closer to a budget fitness tracker with the features onboard, making the price a bit high for what it offers. Here's a detailed breakdown of our time with the Philips Health Watch. It was clear from the beginning that the medical grade device wasn't going to be a looker. 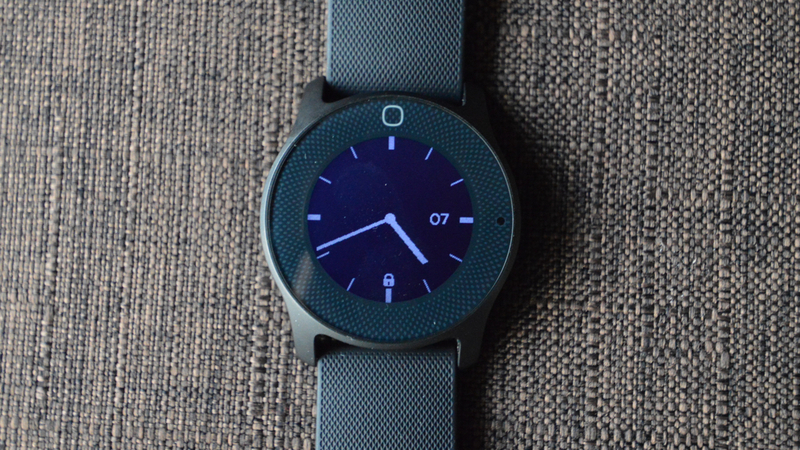 The Health Watch design could be described as a very distant cousin of the Pebble Time Round or even the Withings Go. That said, it's not the worst watch you could pick and could fall under the category of 'retro' much like the first Pebbles. The lack of flashiness isn't going to be for everyone, but some may find the plain look appealing if the bling of Fossil or Apple Watch are too loud. The monochrome, 192 x 192 pixel screen is easy to read in bright sunlight but at night, you'll have to wake the watch with a tap to turn the backlight on. That's great while you're sleeping, but in other cases, may not be so useful. The thick bezel stands out the most here and in this case, it serves the purpose of being the Health Watch's touchscreen. That's right, there's touch capability but it's limited to the bezel, which Philips calls a touch ring. I forgot this often at first and would try to swipe on the screen constantly but over time, got used to it. There were however also moments where it didn't register swipes and I'd have to find a sweet spot for it to work. I eventually learnt you can't swipe too high or too low on the screen, which is a tad annoying. Bezel and software aside, the stainless steel watch body itself is relatively small but thick and raised pretty high on the wrist making it pretty chunky looking. It was comfy enough though and fortunately, every box comes with a strap for smaller wrists. Since Health Watch isn't for intense workouts, you won't find waterproof capabilities with it. Philips does note that it's splash proof though, but it's not recommended to shower while wearing it. Like I said previously, the Health Watch is not a smartwatch. There's no Android Wear or Tizen - rather it's Philips' own proprietary software. It's extremely simple and aside from swipes, taps on the bezel to start and stop actions, there's nothing further to interact with. That also means there's no notifications whatsoever being delivered from your smartphone to the wrist. You will get a little buzz within the hour to remind you to get up and that's your lot. What it can do is the usual array of fitness tracking. With only an optical heart rate sensor and accelerometer inside, the Health Watch can auto-track steps, sleep, calories and heart rate. How well it displays the information is another story. From the watch, you're able to view six different menus from the main circular menu including the ones just mentioned; settings and an alarm section are the other two. Once auto-tracking kicks in, you'll have to unlock the watch, then tap on the respective menu to see your progress whether that's heart rate, walking, running or bicycling. This is fairly inconvenient since you're not only going to be a sweaty mess, but wasting time fiddling around with the interface. And yes, the Health Watch only tracks walking, running and cycling. It would be much more useful if more data could be shown directly on the main face. Luckily, it's just as accurate as the Fitbit Charge 2 and the iPhone 6S it was paired to. During a strenuous 10-mile hike with 2,750 elevation gain, the Health Watch and phone picked up about the same amount of steps. To be clear, there's a discrepancy with the Charge 2 because mid-hike, I sprained my ankle and had to hobble the rest of the way. The Fitbit was on my right wrist which saw a lot more sporadic movement since I was using a walking stick to balance myself. For resting heart rate, the Health Watch is able to match the Polar H7 chest strap beat for beat. I wasn't able to get all the data from the hike with the H7 but the numbers from the Fitbit and Philips synced up to show some interesting information. My HR spikes around early afternoon when the hike began and the elevation started to climb as I was huffing up the mountain. A bit later you can see in the charts when I've sprained my ankle. We've already noted the Charge 2 isn't the best at capturing HR over 180 and it shows here. But the Health Watch clocked in around 180s while the bit of chest strap data I managed to pull in shows it around the 180 zone as well. The Health Watch didn't pick up the Fitbit's spike during the last stretch of the hike though which is odd since there was one final horrible hill to shuffle over. Overall, the heart rate sensor did a suitable job on a painful journey. I'm also sure the audience Philips is targeting would use the Health Watch for less demanding exercises since seasoned hikers have their pick of more robust trackers. However, if moderate users find themselves on a taxing walk, run or bike ride, it's safe to say the Philips Health Watch should be able to measure heart rate well. On first glance, it appears that the Philips app has everything you need in an easy to read manner. Upon deeper inspection, it's become clear that the interface needs some work. The main page you see is great - everything is nicely laid out depending on your chosen goal of losing weight, being more active or tracking your habits. It would be a tiny bit better if you could customize the dashboard widgets though. For example, if I choose 'lose weight' as my main goal, it doesn't show heart rate information right away - you have to tap on 'all your data' to find it. It's understandably set up to best optimize your goal experience but a little leeway with icon rearrangement by the user wouldn't hurt. Then there's the 'all your data' section. You can turn your phone horizontally to "explore your data" but this also means you're able to scroll through to other days and see more information. After figuring this part out, depending on what you're looking at, the sections are either easily read or clumped together and could be better if separated. Specifically, the heart rate charts can be viewed as 24-hour, 12-hour, 4-hour or 1-hour chunks which spells everything out pretty nicely. The sleep section could use the same treatment. You're presented with metrics that could be really useful: time slept, sleep efficiency and sleep stages, but when opening up each section, it's just a weekly or monthly view that doesn't tell you much. There's some color coding here for sleep and awake times, but in the sleep stage section, you can't see data from previous nights. There are other tidbits to help users along with their goals. The newsfeed is meant to provide motivation, reminders, tips and personalized data snippets all of which you can bookmark. It's a nice sentiment but so far, there are mostly repeat scraps from other days. What Philips does show is sweet and short making it digestible yet informative. Other apps like Samsung S Health have way too much text that no one's going to want to read. Philips says the battery life lasts up to four days on a single charge. I've been able to squeeze out seven days and that's wearing it to sleep and hiking/camping. It's not surprising that the Health Watch's battery is a trooper - there aren't notifications beyond the sedentary reminders. The watch face also isn't always on and the monochrome screen doesn't eat up a lot of battery. The USB cradle charger is magnetic and fits right onto the back of the watch discretely. It also juices it up to about 70-75% after 35 minutes from a dead state. The Philips Health Watch isn't a tracker for the enthusiast, or even the moderate wearable user. The company has noted it's for people who want to start making healthy lifestyle changes and the Health Watch stays true to that. But there were moments where it fell flat with the app, touch ring bezel and not displaying data on the watch face. While the heart rate sensor is good and the battery lasts longer than your average wearable, those features alone can't fully justify the $250 price tag.